Bair Island Aquatic Center - Attention: Bair Island & Corkscrew Slough Status! NOTE!! Inner Bair Island has been breached!! YEA!! The flows at Smith restrictor are basically the same as before (thank goodness). The turbulence is more around the Smith restrictor, but no real change in timing. You can get into/out of Inner Bair at about 1 hour after high tide (as measured at Wharf 5). Whether you are a BIAC member or a harbor visitor launching from the public ramp on Chesapeake, if you want to explore the waters of Bair Island, especially circumnavigating the Corkscrew, this is worth your time to read. We also have a page for other adventures here, but reading this page is your first step. If you plan to stay just in the harbor and near Bay you may skip this. Clockwise: If you leave BIAC at High Tide as measured at Wharf 5 in the harbor and go clockwise, you will have a good safe row through both Flow Restrictors. 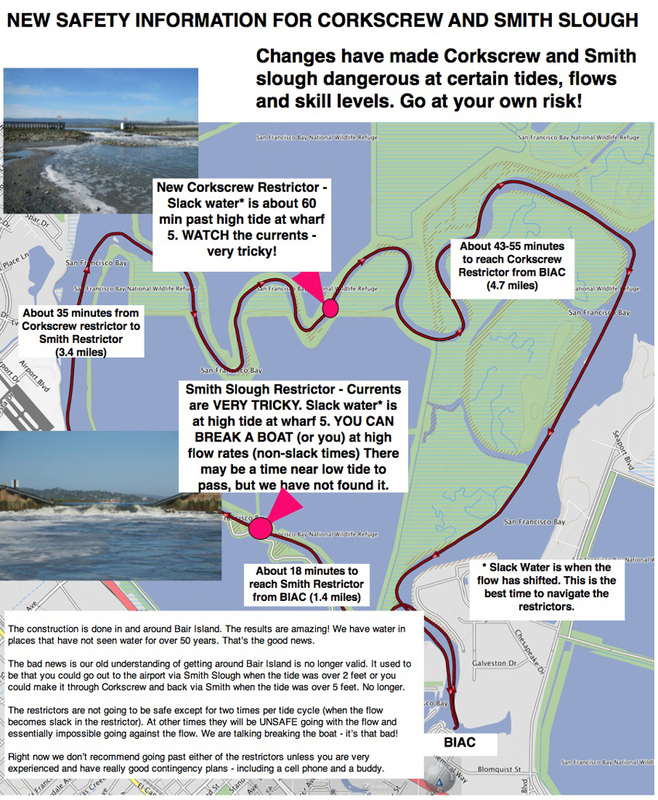 The Smith Restrictor will be very close to slack tide and Corkscrew will be flowing slightly toward Redwood Shores, but an easy passage - take a few minutes to linger and Corkscrew will be slack. Counter Clockwise: If you leave BIAC 45 minutes before High Tide as measured at Wharf 5 you can do Corkscrew counter clockwise. You will go with the flow at Corkscrew and again with the flow at Smith. It will be slightly more squirrelly water than the clockwise row - but still easy. In fact, at any tide level you can enter Corkscrew from the East end near the Wires in the Port of Redwood City. 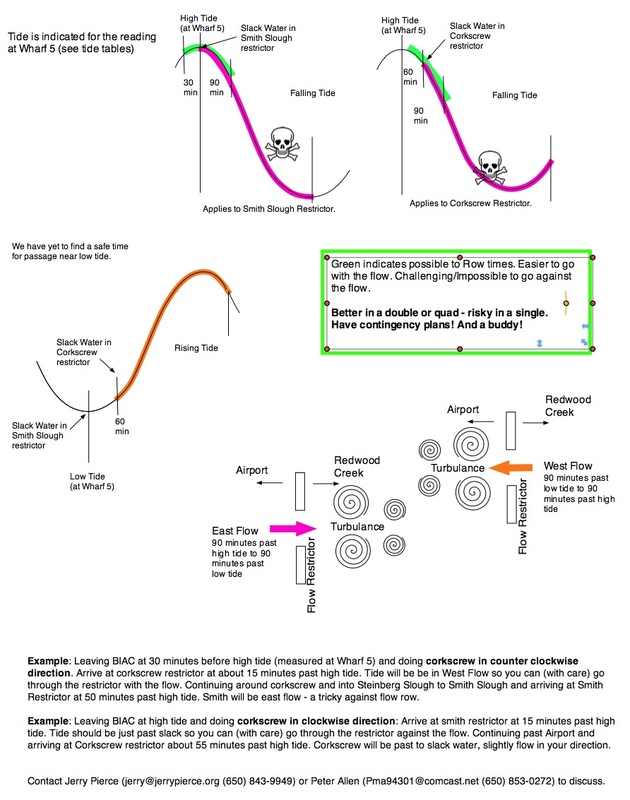 But if you are outside of the prescribed tide profile you will not be able to get safely past the Corkscrew Restrictor; Enjoy the resident harbor seals and return back through the harbor. At high tides the tide will always be above 4'. Above 5.5' the sloughs are deep almost everywhere. At a 4' to 5' tide there are many places where it is shallow - you may need to go to the deeper part of the channel. Where is the deeper channel? Ask Jerry/Peter! There is another option past low tide, but a bit more tricky! ONLY do this if you have a thorough conversation with Peter/Jerry to know WHERE in the island is deeper water. Passage is possible at a 4’ tide, but only in certain places inside of Bair Island. Using ski terminology these become “Black Diamond” runs. Single shells are not recommended yet with this option. 2) If you leave BIAC at 1.5 hours after Low Tide as measured at Wharf 5 and go clockwise you can do Corkscrew - BUT YOU NEED TO KNOW WHERE THE CHANNEL HAS DEEP WATER. YOU NEED TO PAY ATTENTION!! It is possible that you might need to turn around. Pay attention! The construction, flow restrictors, and levy breaches are almost done in and around Bair Island. The results are amazing! We have water in places that have not seen water for over 50 years. That’s the good news. The bad news is our old understanding of getting around Bair Island is no longer valid. It used to be that you could go out to the airport via Smith Slough when the tide was over 2 feet or you could make it through Corkscrew and back via Smith when the tide was over 5 feet. No longer. The restrictors are not going to be safe except for two times per tide cycle (when the flow becomes slack in the restrictor). And those windows may be as short as 30 minutes. They will be UNSAFE going with the flow and essentially impossible going against the flow. We are talking breaking the boat - it’s that bad! This will change as Steinberger Slough becomes scoured out and allows more flows. We have a moving target! This is the Corkscrew Restrictor at a 2' tide - dropping tide, 5 hours past high tide. It is not safe going either direction. Another view of the restrictor at Smith Slough (tide going out). Not a pretty rowing picture! 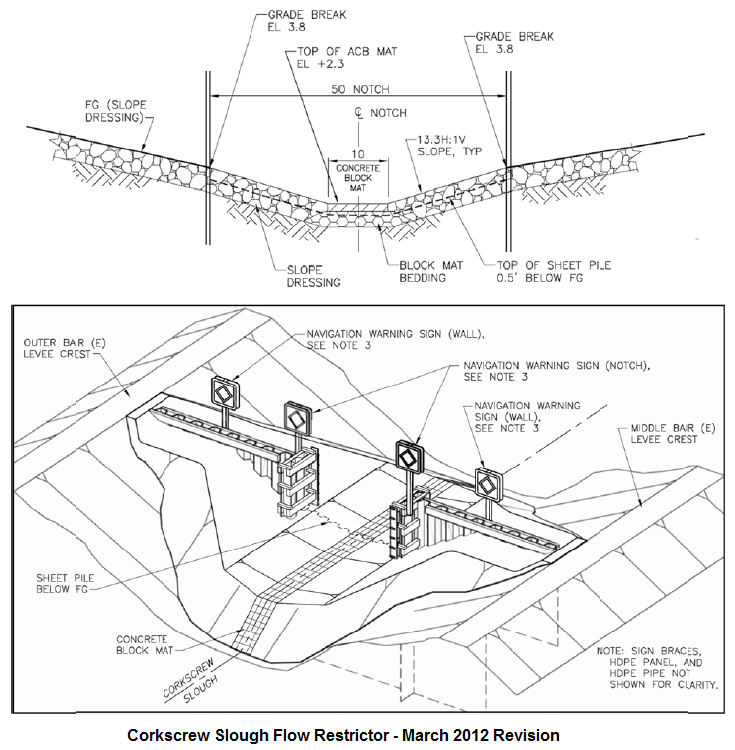 January 2013 Update: The Smith Flow Restrictor (FR2) is under construction and still closed as of February 1, 2013 (there is a barge in the middle of the channel). Meanwhile the Middle Bair Levees have been breached (MB1-5) and tidal flow is surging into ~650 acres that has not seen natural inundation for almost a century. Today it takes a 4 mile row down the Channel and into Corkscrew to navigate the rapids of the new Corkscrew Restrictor (FR1) and then reach the first accessible breach (MB1) into Middle Bair Island above a 6' tide. Once Smith Slough reopens many new adventures will be accessible within a 1 mile paddle up Smith to MB3. Middle Bair Island's levees have been breached in four places ( the map below and talk with Jerry Pierce or Peter Allen before heading out, for their experiences. The Corkscrew Flow Restrictor (FR1) at an 8' tide looking west. Hairpin turn #4 is on the far right and the new levee breach (MB1) is in the distant middle. Just past high tide, a low flow is still moving into Corkscrew toward the MB1 breach. The underwater dam between the Restrictor's higher sides is a low V shape and allows shallow passage at a 5' tide. It is also designed so that paddlers can portage over the center at even the lowest tide. Breach MB1 (see below for map) just west of the Corkscrew Flow Restrictor. VERY FAST FLOWS! The water is flowing fast through uneven underwater terrain. Squirrely water extends 100 meters. The water level falls and currents collide to create hazardous eddies long past the actual levee breach. Middle Bair water levels lag adjacent Steinberger and Corkscrew levels by up to two hours, ebb or flow. 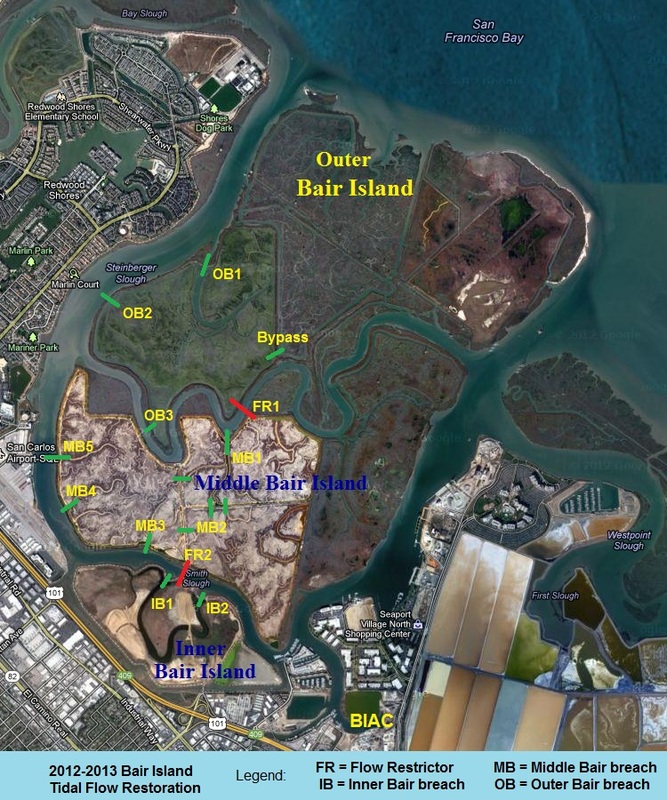 Bair Island has had modifications to restore pre-industrial tidal flow to this wetland while not adversely affecting the Port of Redwood City and upper Redwood Creek (with increased silting and flow). The effort is led by the US Fish & Wildlife Service, with the work contracted out to Ducks Unlimited. BIAC was involved in 2011 and early 2012 in understanding the plans and ensuring that public aquatic access would remain reasonable during and after construction. During construction in 2012 and early 2013 access to Corkscrew and Smith Sloughs was interrupted, yet the result is a whole new world of aquatic adventures. Landings on Bair Island are still be prohibited, but smart attention to tidal patterns will present you with a new adventures and public access to a stunning wetland and wildlife preserve. The usual paths around Bair Island have many new tidal flows and areas to explore. 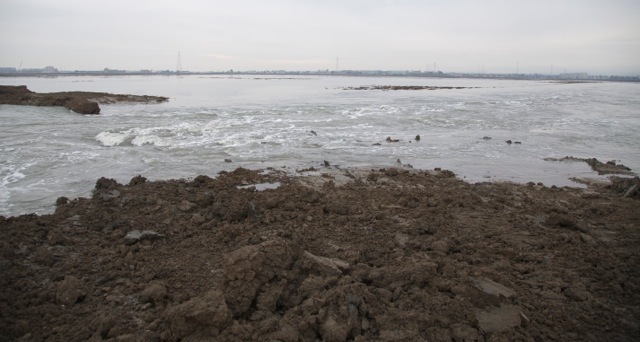 Watch for squirrely marine flows in and out of the new levee breaches as well as shifting mud flats. 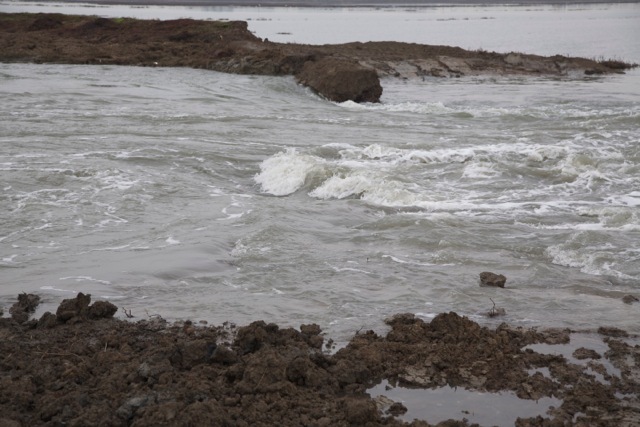 These new flows will scourge out Steinberger Slough - a process that will continue for decades. 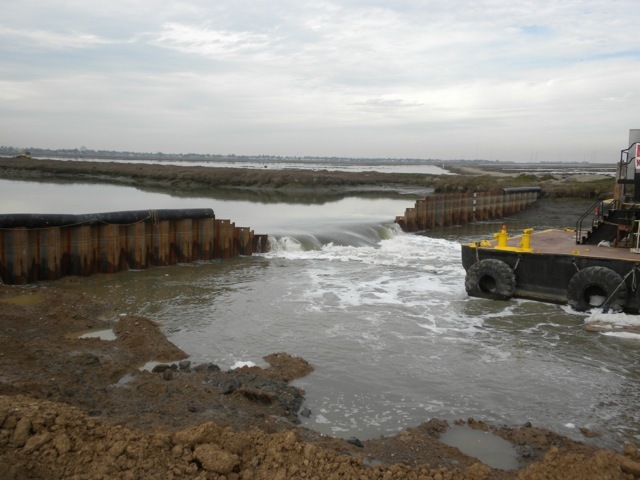 Two "Flow Restrictors" have been built - one halfway through Corkscrew Slough (FR1) and the other halfway up Smith Slough (FR2) - to prevent additional tidal flow and silting into Redwood Creek and the Port of Redwood City (saving million$ in dredging fees). 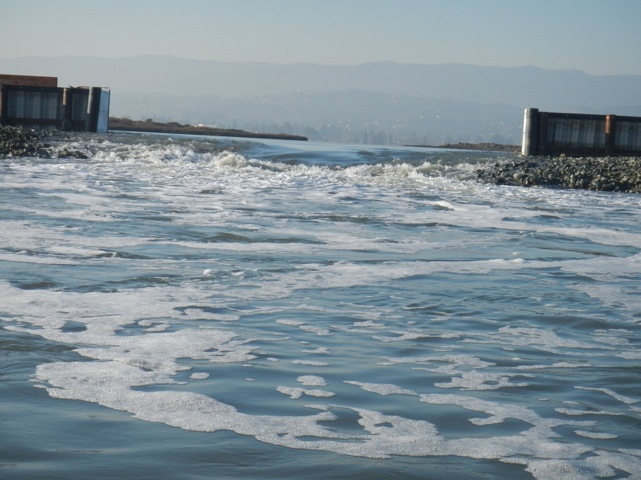 These micro dams encourage more tidal flow into Bair Island from Steinberger Slough to the north and should scourge out a deeper channel there as more water flows in and out each day. These structures will still allow aquatic access through Corkscrew and Smith at current tide levels (5' and 2' respectively). The old salt pond levees inside of Middle and Outer Bair Island are breached in many places to restore former sloughs and to recreate the original tidal wetlands of Bair Island. See the image below for details. These breaches are about 50' wide and create new tidal rushes in and out during ebb and flows - so watch for marine flows that could upset your paddling or rowing. At the time of this writing (February 2013) the Corkscrew (FR1) and Smith (FR2) Restrictors are complete as are the Outer and Middle Bair Island breaches. The dynamic current flows are hazardous. At peak flows the drop from one side to the other of a flow restrictor can be as much as 3 feet.